Send an email prematurely? Forgot to attach a file? Accidentally addressed it to the wrong person? It happens to the best of us. But what can you do to get it back? Hack into the other person's email account and delete the email before they get a chance to see it? Unless you're a hacker extraordinaire, that option is unlikely. So, what can you do? If the email has already been sent, you're probably out of luck. Even if they didn't read it yet, your chances of retrieving it are slim. But some popular email clients like Gmail do have features built-in that let you pause the sending process, giving you a few seconds to recall your message. Some platforms, like Outlook, actually let you steal it back, as long as it hasn't been read. 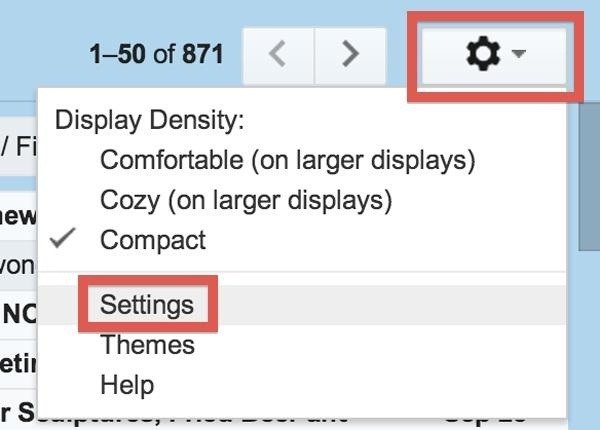 Google has a really easy way to undo sent emails, only you must enable it in your Gmail settings. Once enabled, you'll have anywhere from 5 to 30 seconds to undo the email, depending on what you select. To enable the "Undo" option, first click on the gear symbol in the upper right and click on Settings. In the General tab, scroll down and find the Undo Send feature. Enable it, choose your preferred wait time, and select Save Changes at the bottom of the page. Now whenever you send an email, you should see the Undo button at the top of your screen in the yellow sent verification. This option will disappear after your allotted wait time chosen. After clicking on it, it should say "Sending has been undone" and you should receive the email back in draft mode. Obviously, you can't undo sent mail once it has already been sent to the recipient. All that this feature does is halt the send process, giving you an easy chance to renege. It's actually a bit easier to recall a message in Microsoft Outlook. Delete unread copies of this message. Delete unread copies and replace with a new message. Click on OK and if you chose to resend, update the message and send like normal. You can watch a video of the process here. You can also just find your sent message and click on File -> Info -> Resend or Recall. It's pretty much the same as above, only on the Message tab, go to Actions -> Other Actions -> Recall This Message and proceed as above. Just like in 2007, go to the Actions menu and click on Recall This Message, then proceed as normal. 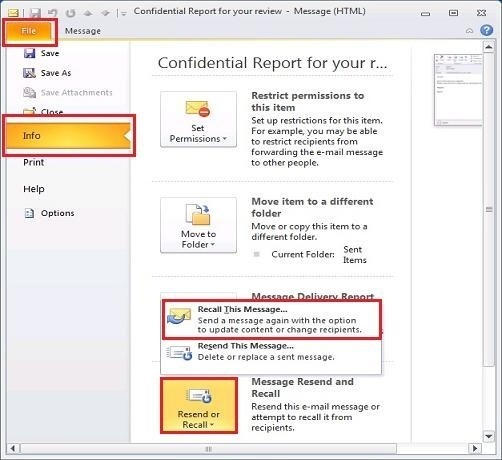 NOTE: You need to have Microsoft Exchange in order to use this feature, and so does the person you are sending it to. You can't undo sent mail once it has been read. Unfortunately, Yahoo can't undo sent messages at the moment. And you can't use something like Outlook, since that only works with a Microsoft Exchange account. Yahoo recommends saving drafts first and thinking twice before sending. Select Mail | Sent Mail from the menu in AOL. Highlight the message you want to take back. The message was sent to AOL recipients only. You sent the message from AOL itself, not from an email client using IMAP and SMTP to access an AOL email account. The message has not yet been read by any recipient. What About the Other Email Services? For the other email services like iCloud, Hotmail and Facebook email, there are no current ways to undo any sent messages, unless you know something I don't. And of course, you can always just pull out your Ethernet cable right after you send your email in hopes of catching it before it sends. 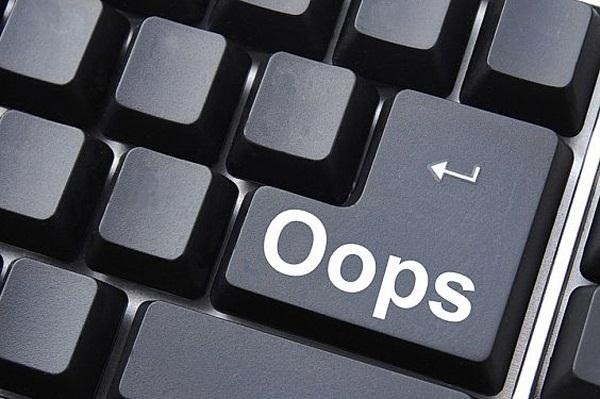 But if you really have a problem with sending emails prematurely or to the wrong person all of the time, I suggest you start hitting the draft-saving button instead of the send button, like Yahoo suggests, then come back five minutes later and make sure it's all good. Though, then you run into the problem of forgetting to come back and send it. 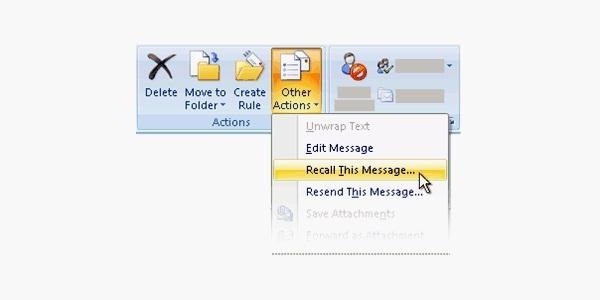 The Recall with Outlook only works well if you are on an Exchange server, and you can send you recall before the recipient has opened the message. If you are sending over the internet through your ISP using POP3 or IMAP you are pretty much out of luck, the recipient will receive the original email plus a recall request and possibly a third email with the replacement email. True... Though it depends on the recipient's email client. 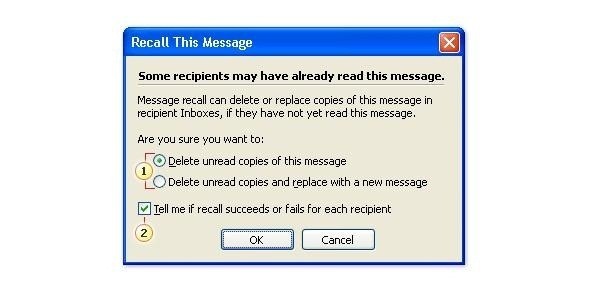 Some email clients (such as Outlook) do automatically honor recall requests by default, though it is possible for your recipient to change their settings to allow them to decide weather or not they want to honor recall requests on a case by case basis. This will also fail if the recipient has rules that affect the folder where the original message is stored. 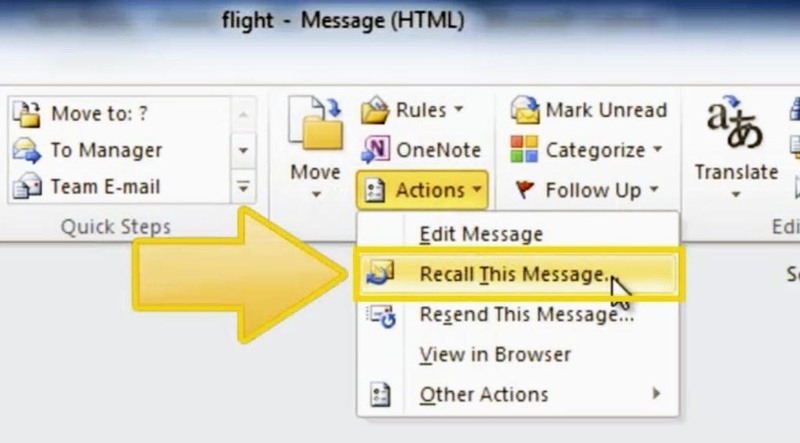 eg: If the original message is moved to a subfolder by a rule that is run as soon as the email is received then the recall message won't work as they both have to be in the same folder in Outlook. i sent an email to wrong address, how i will delete this email??? Gmail now has this feature (June 2015). Up to 30 seconds delay before it REALLY sends the email. Secondly, --it seems-- even after activation, it'd work just for some minutes, not for longer periods, like a day or so. Right?